Bellafonte, Pa., Lodge No. 1094 partnered with Penn State’s 4-H mentoring program to provide school supplies, backpacks, dictionaries and support to more than 250 students in need. With the help of an Elks National Foundation Gratitude Grant, the Elks held a picnic where students could collect their supplies. 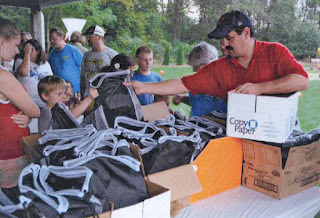 Here, Lodge President Dale Moore passes out the school supplies.